The evil Alarac is hunting the Keepers once again. Now Nyssa and her uncle must flee for their lives. 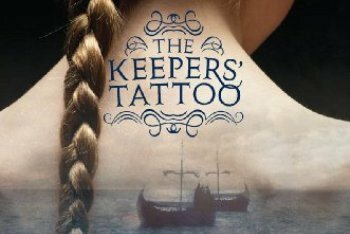 Check out Kidzworlds book review and summary of The Keepers Tattoo by Gill Arbuthnott. It all began 10 years ago when twins Nyssa and Kit were four years old. Alarac, the evil leader of the Shadowmen, set out to eliminate the Keeper’s—a group of people who share the profound and ancient knowledge needed to keep the world afloat. Only once the Keepers were out of the way could Alarac rule. When he and his Shadowmen attacked, he kidnapped Kit. Fortunately Nyssa escaped. Nyssa was raised by a kind pub owner, William, without any knowledge of her previous life. But now Alarac has returned and he’s searching for the surviving Keepers. William and her uncle Marius give Nyssa a crash course on her past. Her mother and grandmother died in the first attack. And so did her brother Kit, or so they believed. Now Nyssa and her uncle must run for their lives. But Nyssa begins having strange dreams—dreams of the evil, pale-skinned Alarac…dreams through her brother’s eyes. Kit is still alive. Nyssa plans to travel to the island of the Shadowmen and rescue her brother. But she has to be careful. The Shadowmen are after her specifically. She and Kit both have half of an ancient spell tattooed on the back of their heads. Alarac has half the spell. And now all he needs is Nyssa. The Keeper’s Tattoo by Gill Arbuthnott is a very original story. It explores bravery, [kwlink 2052[b]fear[/kwlink], stubbornness, and the power of a family bond. For a book set in such a historical setting, it is very fast-paced. Most books of this genre have a lot of down time while the characters travel by horseback. But not in this book. The Keeper’s Tattoo is an all-round exciting adventure. Tell us what you think in our comments section below! Who'd You Let Tattoo You? Vote! Only a famous tattoo artist. Anyone as long as they are talented.